KIEV, Ukraine -- President Viktor Yanukovych is undergoing his biggest test since taking power, over tax reforms that sparked the biggest protests in Ukraine since the Orange Revolution, analysts said. The protests have been led by small business owners and the self-employed. The reforms passed earlier this month by parliament are due to come into force on January 1 but the bill still needs to be signed by the president, who on Saturday indicated he might refuse it. Thousands of Ukrainians have turned out in noisy demonstrations across the country against the reforms, in a nasty surprise for Yanukovych just as he seemed to be asserting his authority after taking power in February. Ukraine has not seen protests on this scale since the 2004 Orange Revolution popular uprising that ousted the old elite and installed Yanukovych's pro-Western predecessors in power. The burly president -- who has made stability his mantra -- on Saturday took the unusual step of meeting protestors in the capital, saying he was likely to veto the tax reforms but the decision required further review. The protestors have set up tents for a non-stop sit-in on Kiev's Independence Square that was the hub of the Orange Revolution, in a jolting reminder for Yanukovych of the perils of ignoring public anger. "The likelihood of a veto is high," Yanukovych said as he met the protestors alongside Prime Minister Mykola Azarov. "But we can say more about it later, after we all sit down together and review the tax code again." The protests have been led by small business owners and the self-employed, who argue that the tax changes will ruin their livings by benefiting only big firms close to Yanukovych's ruling Regions Party. "The protests have been an unpleasant surprise for the presidential administration. 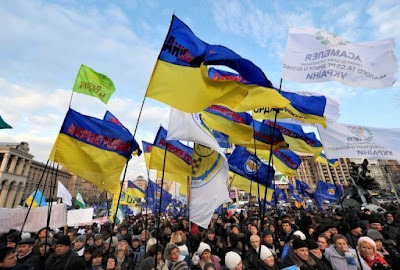 I think they did not expect such mass protest," said Volodymyr Fesenko of the Gorshenin Institute of Management Issues in Kiev. "The authorities were not ready and underestimated the possibility of such mass protests. For the first time in the last five years, we are seeing large protests by social groups, even if their numbers are not comparable to 2004." Yanukovych rose to prominence as a politician with the support of industrial magnates in his home region in east Ukraine, and Fesenko said the protests had shown up the failure of the administration to communicate with ordinary people. "I will take the decision which best protects the interests of everyone, above all the state," Yanukovych told AFP in an interview last week. The government has defended the tax changes, saying they will close up loopholes that have allowed small businessmen and the self-employed to get by paying tax on a largely ad-hoc basis. According to Olena Belan, economist at Dragon Capital in Kiev, most anger has been caused by the increase in the powers of the tax administration rather than specific tax hikes themselves. Ukraine is under pressure to improve its fiscal discipline under the terms of a new loan deal agreed with the International Monetary Fund (IMF) after the financial crisis plunged the country into a deep recession. But Belan noted that the tax dispute was largely a separate issue, as while the IMF wanted more fiscal discipline from the government, its drive was about cutting expenditures and not increasing revenues. Thanos Arvanitis, IMF mission chief for Ukraine, said this month "that the tax code is expected to be broadly revenue neutral." In another worry for the authorities, the protests have shown a rare unity across a country often marked by stark regional divisions. The Orange Revolution was greeted rapturously in the Ukrainian-speaking West of Ukraine but with suspicion in the Russian-speaking industrial east. But protests have taken place in Yanukovych's home stronghold of Donetsk in the east of Ukraine and the central industrial city of Dnipropetrovsk, as well as the nationalist bastion of Lviv in the west. In Kiev meanwhile, the city court has banned protests in the city centre but the police have made no effort to disperse the demonstrators. "The authorities do not know what do to with the protestors, resort to force or find a compromise," said political commentator Vitaly Portnikov, warning that any use of force could provoke a new uprising.